Fifty-five Marine officer candidates barked in unison as they stood in two perfectly straight lines on either side of the aisle running through the barracks. “Now grab your brushes and begin scuzzing the dirt to the center aisle!” screamed the Sergeant Instructor. The response echoed off the cinder block walls. Within minutes, the three feet of cement floor between each of the bunkbeds became the cleanest pieces of real estate in the building, and two candidates came down the center aisle with push-brooms to move all the dirt into dust pans. Floor spotless, it was time for bunks, boots, footlockers. And all the time, the Sergeant Instructor stood at the front of the aisle, watching. It was 5:12 AM, and I was already wondering how I was going to push through yet another day at Marine Corps Officer Candidate School. One week down, nine weeks to go. The days were already starting to blend together, each one more difficult than the last. My body never felt recovered; it was just healthy enough to push through another grueling five-mile run. Despite eating three square meals a day, I was always hungry. Sitting in class became more about struggling not to fall asleep than absorbing the material. And on top of all that, there was the yelling. When I think about Officer Candidate School in twenty years, the thing I will remember the most will probably be the yelling. Whenever you addressed a Sergeant Instructor, you yelled. If you were asking a question, you yelled. If you were running with cadence, you yelled. It took two weeks for my throat to stop hurting because of all that yelling. And when we weren’t yelling, we were likely getting yelled at. We were yelled at for not running fast enough. We were yelled at for not cleaning thoroughly enough. We were yelled at for not yelling loud enough. Sometimes, we were yelled at just because we happened to be the candidate closest to the Sergeant Instructor when he felt like yelling at somebody. The Marine Corps describes Officer Candidate School as controlled chaos, and that is exactly what it felt like, except lighter on the control and heavier on the chaos. In all that chaos, the hardest part was finding the thing to motivate you from one day to the next. It was difficult to be motivated when you felt so alone, and the feeling of isolation could be overwhelming. Being screamed at by a Sergeant Instructor in the middle of a squad bay is mortifying, and despite being surrounded by fifty-four other candidates, I have never felt more alone. The second Wednesday at Officer Candidate School was the first day we could go to religious services. We went to the auditorium where we normally had classes and we met Chaplain Byrd, who was the first person to smile at us since we had arrived at Candidate School. He asked us who we were, where we were from, and what caused us to sign up for the Marine Corps in the first place. For the first time, we could smile, laugh, and talk at a normal volume. Being at chapel wasn’t just our time to worship, it was a time to feel like we were part of a community and to know that there were many others who were going through the same struggles that we were. As the weeks went by, chapel became our refuge, and the place where we experienced the Lord’s empowerment to carry us through the next week. I have since graduated from Officer Candidate School and attempted to leave most of those memories behind. I am now referred to as 2nd Lieutenant, not candidate. Instead of having to scream around sergeant instructors, we exchange a mutual salute. The memory of religious services, however, is something that has stayed with me. We often think of Marines as being mentally, emotionally, and physically strong, but Chaplain Byrd made me realize why being spiritually strong is just as important. I realized why even the Commandant of the Marine Corps has recently declared spiritual health to be a priority for officers to instill in their Marines. I still have a long road of training ahead of me before I join the Reserve forces, but I know that I want to empower those Marines in my command just as Chaplain Byrd empowered us. It is out of this desire that I volunteered to take Lay Leader training later this year. It will allow me to be an assistant to the Chaplain and a resource for any Marines who have questions or need guidance in their walk of faith. It will also allow me to help create those spaces where Marines can lay down their guard, share personal information, and call each other by name. I want them to be able to experience the strength that comes with a healthy and full relationship with Christ. As an officer, I want to make Marines who are strong physically, emotionally, mentally, and spiritually. I want to give them the community where they can speak and be heard—yes, even at a normal volume. —Alex Nallin is a 2013 graduate of Washington & Jefferson College, south of Pittsburgh, Pennsylvania. 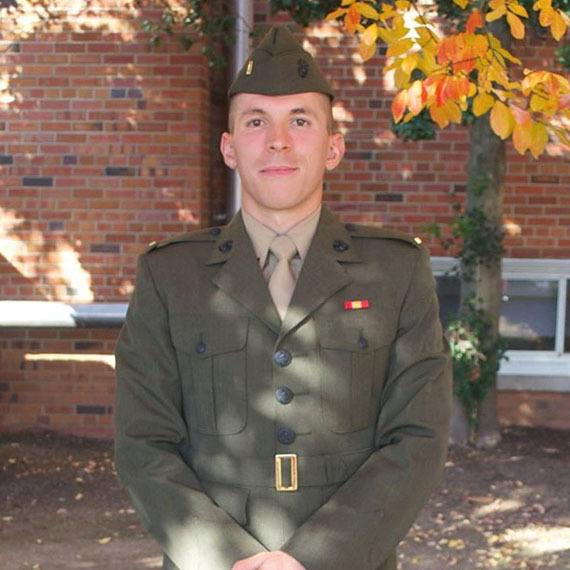 He is currently stationed at Quantico, Virginia, where he is completing Basic Officer Course and will then move on to his military occupational school before joining the Reserve forces. As a civilian, Alex is a Program Analyst for the Department of Labor and part-time English tutor in Washington, DC.